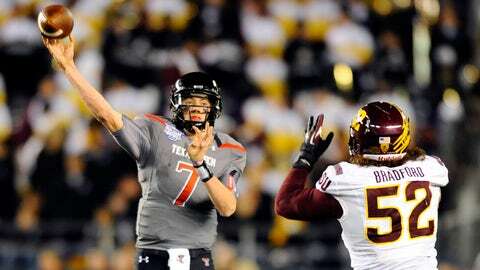 Texas Tech's Davis Webb tied the Holiday Bowl record with four touchdown passes. The Holiday Bowl is known for at least a couple of things: getting over really late and producing a lot of offense. Monday night’s game lived up to its lineage, but not in the way most football people were predicting. It ended at about 2 a.m. Eastern time, and Texas Tech and Arizona State combined for 60 points. But underdog Tech, which stumbled through the second half of the season, came out on top, 37-23, mostly on the strength of a dynamic first half, with a freshman quarterback providing the fireworks. Texas Tech seemed determined to get the most out of its appearance in the Holiday Bowl. The Red Raiders brought out cool helmets. And in the first half, they wanted to get in as many plays as possible. Maybe Tech was trying to make up for the way it finished the year, with five straight losses after a 7-0 start. The Red Raiders hadn’t won a game since Oct. 19. So with freshman Davis Webb at quarterback, Tech operated against No. 16 Arizona State as if it were afraid the play clock might blow up if it got under 20 seconds. The pace kept the Sun Devils off-balance, and the Red Raiders offense looked a step — or two or three steps — faster than the ASU defense. Heading into the game, word was that Tech would alternate Webb with sophomore Michael Brewer, who is a better runner. Brewer got in for a few plays, but once Webb got rolling, he wasn’t coming out. By halftime, Webb had tied the Holiday Bowl record with four touchdown passes to give his team to a 27-13 lead. Webb had targets big and small. The biggest was All-America junior Jace Amaro, a 6-foot-5, 260-pound tight end who is going to make an NFL quarterback very happy, reportedly next season, according to ESPN. Amaro had eight catches for 112 yards, making him the all-time FBS leader for receiving yards by a tight end, with 1,352. The smallest was 5-6 Jakeem Grant, who caught two of Webbâs TDs and skittered through ASUâs secondary. Meanwhile, what was going on with Arizona State? The Sun Devils were the ranked team, and they were the ones who had won seven straight to finish the regular season before falling to Stanford in the Pac-12 title game. But they must have left a wake-up call for sometime in the second half. Or maybe it is just the Holiday Bowl jinx. ASU has been to four of them and lost each one. While Webb was throwing for more than 300 yards in the first half — he would finish with 403 — ASU and Taylor Kelly totaled 14 passing yards. The pace slowed in the second half, but Arizona State never did get on track. In a moment that summed up the Sun Devils’ lost opportunities, Richard Smith broke open at the goal line, then dropped a perfectly thrown deep pass from Kelly in the end zone. A touchdown could have put ASU within seven points with nearly 10 minutes left in the game. *Arizona State’s All-America defensive tackle, Will Sutton, was a non-factor. It’s not easy for a 300-plus-pounder to disappear, but he was nowhere to be seen for much of the game. *Battle of the helmets was no contest. Tech in a rout. Todd Graham can't sweat the details right now. He's got to get his resume to Kinkos before it closes so it gets to the Browns by morning. *Speaking of ASU coach Graham, he calls the defensive signals, and ESPN’s announcers noted that he put on a bright yellow windbreaker during the first quarter to make himself easier to see on the sideline. How did National University not get a bid to the Holiday Bowl?